Won or Placed on all 3 surfaces. Outrageouslyfunny will be added to TrueNicks soon. Please contact me to get the cross result on your mare with Outrageouslyfunny. By DISTORTED HUMOR (1993). Stakes winner of $769,964, Commonwealth Breeders' Cup S. [G2], etc.Leading sire in U.S., sire of 12 crops of racing age, 1181 foals, 885 starters, 109 stakes winners, 3 champions, 687 winners of 2318 races and earning $92,807,658 USA, including Funny Cide (Champion in U.S., $3,529,412 USA, Kentucky Derby [G1] (CD, $800,200), etc. ), Some Are Bent (Champion twice in Australia, $876,959 USA, 3rd Yalumba Plate), Don Dandy (Champion in Puerto Rico, $413,963, Clasico Dia de Reyes twice, etc. ), Regal Ransom (Hwt. in United Arab Emirates, $1,894,835 USA, Saeed & Mohammed Al Naboodah Group U.A.E. Derby [G2], etc. ), Pathfork (Hwt. in Ireland, $237,871 USA, Boylesports.com Vincent O'Brien National S. [G1], etc. 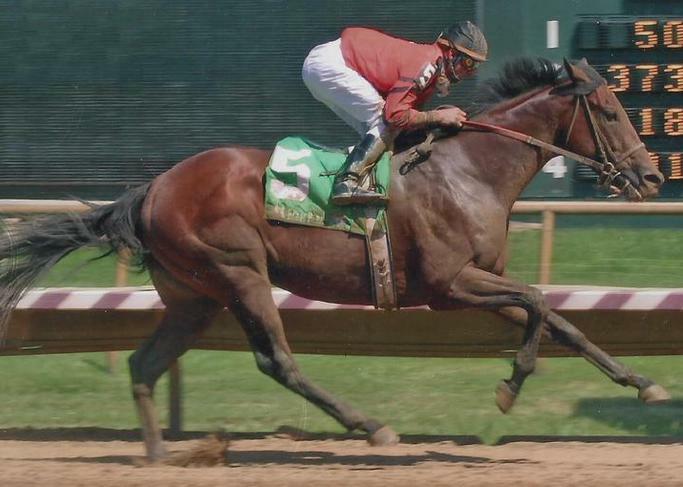 ), Drosselmeyer ($3,728,170, Belmont S. [G1] (BEL, $600,000), etc.). Outrageouslyfunny (c. by Distorted Humor). Black type placed winner, see below. Mystical Sea (f. by Sea of Secrets). 10 wins, 4 to 10, $163,184. Stone Eagle (g. by Birdstone). 3 wins, 3 to 5, 2012, $22,428. Yougotthatgoinforu (g. by Student Council). 2 wins at 2, 2012, $52,095. Capistrano Invitational H. [G2] (SA, $150,000), etc. ), Sandra's Song ($130,107, 3rd Quill S.
Executive Air (f. by Grindstone). 2 wins at 4, $18,067. Outreach (f. by Quiet American). See above. BIG BOOSTER (g. by Accelerator). 10 wins, 2 to 7, $820,623, San Juan Capistrano Invitational H.
City Cup H. [G3] (SA, $20,000), 3rd Hollywood Gold Cup S. [G1] (HOL, $90,000), Goodwood S.
Breeders' Cup Marathon [L] (OSA, $54,250), etc. Heavenly Choir (f. by Saint Liam). Winner at 4 and 5, 2012, $85,270. Matchmaker S. [G3] (MTH, $120,000), 2nd Violet S. [G3] (MTH, $30,000), Twin Lights S.
Not So Sure (c. by Deputy Commander). 4 wins at 3, $67,601. Command the Waters (f. by Deputy Commander). Winner at 3, $7,530. Dottir (f. by Demidoff). 2 wins at 4, placed at 5, 2012, $34,252(USA). Our Girl Shade (f. by Murrandana). 3 wins, 3 to 5, $23,385. Producer. $8,000), 3rd Pinellas S. [L] (TAM, $3,500), Annie Oakley H. -R (TDN, $5,000). Yeside (f. by Affirmed). See above. =Violent Blue (JPN) (f. by =Desert King (IRE)). Winner at 3 in JPN, $58,574 (USA). =Ken Bridge Jazz (JPN) (f. by Adjudicating). 2 wins at 3 in JPN, $38,170 (USA). =Ken Blaster (JPN) (c. by Premium Thunder). 3 wins in 5 starts at 3 in JPN, $8,716 (USA). Side Brush (g. by Broad Brush). 6 wins, 3 to 7, $197,801.